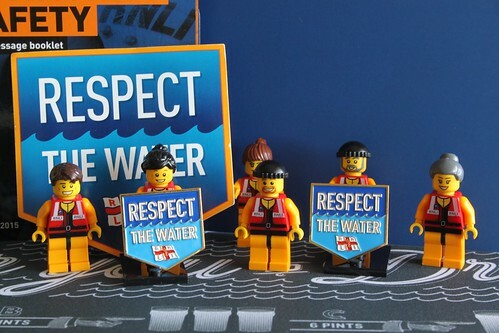 The little guys are delighted to support the RNLI’s ‘Respect the Water’ campaign. The waters around the British and Irish coasts are dangerously unpredictable. Over two hundred people die accidentally each year around the coast. The RNLI wants to change that and has set itself the goal of halving the number of coastal drownings by 2024. Around half the people who drown never expected to get wet – many get caught out by unexpected slips, trips and falls into the water. Living on the edge of the Bristol Channel, the little guys know all too well about the dangers that tidal patterns and hidden currents can present, with the water regularly whizzing past the lifeboat station at Portishead at six to eight knots – that’s faster than most small boats can sail and definitely faster than you can swim. Whether you’re a sailor, a kayaker or just someone who likes to visit the coast, help the little guys to support the ‘Respect the Water’ campaign by checking out the RNLI’s safety information online and watching the videos on the Respect the Water website. And please take that little bit extra care when you’re out and about on the coast this summer. This entry was posted in News and tagged Respect the Water, RNLI, The Lifeboat Crew by Simon Perks. Bookmark the permalink.